A centerpiece of the American Association for the Treatment of Opioid Dependence (AATOD) is the award banquet, honoring leaders for their work in the field. It was no surprise that Michael Botticelli, director of the White House Office of National Drug Control Policy (ONDCP), received the Friend of the Field award at the Baltimore Marriott Waterfront on November 1. 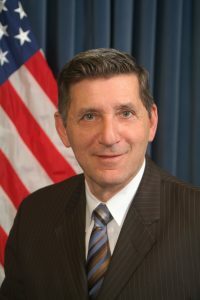 Mr. Botticelli, in long-term recovery from alcoholism, has been a steadfast supporter of treatment, including medication-assisted treatment, during his tenure at ONDCP. He has also championed the use of naloxone to reverse opioid overdoses, and has worked to improve recovery support for people with opioid use disorders (OUDs). Ray Caesar, LPC: The State Opioid Treatment Authority (SOTA) of Oklahoma, Mr. Caesar helped change regulations in the state to make it possible for more opioid treatment programs (OTPs) to open, played a key role in stigma reduction, and now works on Medicaid reimbursement. Spencer Clark, MSW: Under the leadership of Mr. Clark, North Carolina’s SOTA and Mental Health, Developmental Disabilities, and Substance Abuse Services Division have worked together to provide recovery support services and treatment to people in the state with OUDs. Alice Gleghorn, PhD: During her 20 years at the San Francisco Department of Public Health, Dr. Gleghorn worked to ensure access to MAT in several locations, including jails. Robert Kent: As general counsel for the New York State Office of Alcoholism and Substance Abuse Services (OASAS), Mr. Kent has provided support to OTPs during the state’s transition to Medicaid managed care, establishing OTPs as essential providers, and creating regulatory relief where necessary. Robert Lambert, MA: President and executive director of Connecticut Counseling Centers, Mr. Lambert helped create innovative intensive outpatient programs within OTPs; he also developed “Bridge to Recovery,” a peer-mentoring program. Richard Moldenhauer, MS: The Minnesota SOTA for the past 15 years, Mr. Moldenhauer is not afraid to take political risks, successfully advocating for OTP patients. Einat Peles, PhD: Research director at the Adelson Clinic for Drug Abuse Treatment & Research in Tel Aviv, Dr. Peles studies retention and hepatitis C in her clinic in Israel and at a “twin” clinic in Las Vegas. Kenneth Stoller, MD: Dr. Stoller’s Broadway Center for Addiction in Baltimore includes wraparound services that cover housing, primary health care, and other areas, making it a center of excellence. In addition, his research has advocated the cost-effectiveness of treatment in an OTP. Trusandra Taylor, MD: Dr. Taylor has worked in addiction medicine for more than three decades. In Philadelphia, where she served as a clinician and an expert in managed care, she took part in many workgroups and consensus panels at the federal level. Hoang Van Ke, MD: In Vietnam, which historically has treated SUDs as a moral problem, Dr. Van Ke has pioneered the work in MAT for OUDs, showing in 2008 that a methadone clinic pilot could be effective. Under his efforts, the number of clinics in Vietnam has grown from six in 2008 to 250, now serving more than 45,000 patients. Brenda Davis, MS, received the Patient Advocacy Award, named for Richard Lane and Robert Holden, both recovering heroin users. Ms. Davis has been employed as a patient advocate for 20 years by NAMA Recovery, and she helped establish the MARS Project at the Mount Sinai/Beth Israel methadone program in New York City. The awards banquet is supported through a grant from Mallinckrodt Pharmaceuticals.